Sunday thoughts for Armistice Day, 11th November 2018 – For the fainthearted . . . 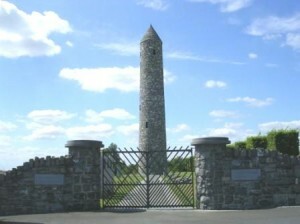 The Island of Ireland Peace Park at Messines in Belgium is a place of simplicity, a place of tranquility. A path leads to a round tower, beside the path there are inscribed standing stones and stone slabs set into the ground. Along with the memorials recording in stark terms the suffering of the three Irish Divisions, there are recorded selections of words from those present. The words include lines from two Irish war poets: Tom Kettle, the politician, economist, writer and journalist, who died in September 1916 and Francis Ledwidge, the peasant poet from Co Meath commemorated in Seamus Heaney’s “In Memoriam F E Ledwidge”, who died at the end of July in the following year. In the nearby town of Ypres, there is a nightly ceremony at the Menin Gate. Last Post is sounded at 8 pm, followed by the reading of Laurence Binyon’s “Ode to the Fallen” and then the Silence before the sounding of Reveille. The Menin Gate is a stone arch upon which are engraved 54,896 names of those Commonwealth soldiers who fell in the battlefields around Ypres and who have no known grave. Fifty thousand names cover a lot of space. Among the fallen of the Royal Dublin Fusiliers there is engraved the name of F. Ledwidge, except this is not Francis Ledwidge. He was in the Inniskilling Fusiliers and, although recorded as “blown to pieces” by the chaplain, there was enough of him found to give him a grave. This initial and surname is the commemoration of Frank Ledwidge, son of Frank and Ellen Ledwidge, of 134 Thomas Street, Dublin. A Private in the Second Battalion of the Royal Dublin Fusiliers he died on 24th May 1915, he was seventeen years old. I wonder how often our remembrance recalls the Francises and forgets the Franks of the world. It is important to remember individuals, all of them; it is important to remember names, because when we remember people and not numbers we retain a sense of human dignity and we retain a sense of the horror of war. The Gospel reading this morning is a far remove from the Western Front, but at heart it is a story of the value that Jesus places upon an individual, it is about the worth of an individual woman who offers everything she had. ‘Watch out for the teachers of the law. They like to walk around in flowing robes and be greeted in the marketplaces, and have the most important seats in the synagogues and the places of honour at banquets.’ Jesus condemns those who dress impressively and expect to be acknowledged by all whom they meet, not because there is anything wrong in the way they dress or in being acknowledged, but because these things are the outward appearances of men who do not value the little people, the ordinary people. ‘They devour widows’ houses’, says Jesus, referring to the custom of the religious leaders of exploiting the poor. Translating Jesus’ condemnation into terms appropriate for the remembrance of war, Jesus would condemn those of the General Staff who were obsessed with their own importance; those who expected acknowledgement wherever they went; those who had no regard for the plight of the ordinary man on the front line. There was nothing wrong in a smart uniform with red tabs on the shoulders, there was nothing wrong with expecting to be saluted, the wrong arose where those things came to represent an attitude where there was no regard for human dignity or human worth. Jesus watches the men of importance and power and he watches the poor widow. The poor widow gave all she had, but her offering counted for very little in the human scheme of things. Whether she had contributed or not would have been a matter of indifference to the keepers of the temple treasury. Her contribution, her life, didn’t figure in the calculations of the powerful. How close the attitude of the leaders in Jerusalem comes to the attitudes of those who threw away human lives with reckless abandon. The individuals did not figure in the big scheme of things, their small contributions would have gone unnoticed. There can have been little sense of human dignity or worth amongst politicians or military leaders who would throw away hundreds of thousands of lives in pointless onslaughts. Remembrance, if it is to be truly Christian, is to remember people as Christ saw them. Remembrance is to remember with a sense of their dignity, because, like each of us, they were created in the image of God. Remembrance is to remember with a sense of their worth, because, as he did for each one of us, Christ died for them. Remembrance if it is to be truly Christian is about individuals because in God’s eyes we belong to no nation, to no army, to no regiment, to no-one’s side, in God’s eyes we stand before him as individuals, created in his image and loved by him. We remember today those, who like the widow in the temple, gave all they had. Even when the last memory is gone, when the last memorial has crumbled, when there is no-one left to tell the story, God remembers. God remembers the Francises and he remembers the Franks, and he remembers those who brought both of them to die in the mud of Flanders. “She, out of her poverty, put in everything,” God remembers the individuals. I’ve been to the tower and found it good. My ex who is Belgian was very shocked that the books of names remained in the alcoves. While I never thought for an instant that they would be bothered in any way by the local tearaways. My only objection was the source of the stone came from a Workhouse and a Barracks. I heard one guide turn it around and say that the stone was a reminder that working people were the ones who suffered – at home or abroad. The Dublin civil service rarely have the feel for something like this. Like with the army officers delivering a flag to the school children in 2016, when it should be the otherway round. Given what went on in the workhouses that stone should be put into the seas to try and wash the screams and pain off them but they hand it over to things like the Glencree, or the arts in Callen. They put the social welfare office over the intake rooms of the old workhouse in Kilkenny up on the Hebron Rd and where the Tuam babies were placed was the cesspit chamber of the old workhouse. What they should’ve done was to have stone from each county.